I spent an hour waiting in the hall at the Population and Immigration Authority of the Ministry of Interior last week. I held number 138; 98 was being serviced upon my arrival. I hadn’t been in this hall for a decade and I was happy to see that somebody at the Ministry of Interior cared about Israel’s citizens. The chairs were comfortable, the place clean. In large signs with no spelling mistakes we meandering citizens who valued every active minute of the day were informed, If you’re late, you lose your turn. Large numbers flashed from all directions inviting 100 to go to clerk number 5 and 101 to clerk number 3. There were enough chairs for the sixty or seventy waiting individuals and even a water fountain that worked on the day that Jerusalemites were told to boil their water two minutes before drinking. 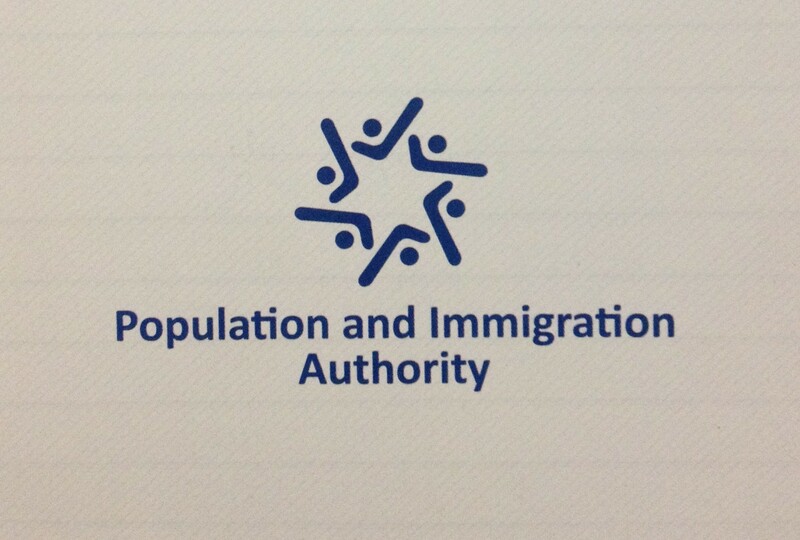 The clerks wore clean white t-shirts over their clothes with the logo of the Population and Immigration Authority stamped over the heart. Some even smiled to the citizens they served. They didn’t eat croissants and drink coffee in your face. You could tell that someone with a Masters in Branding and Service had won a tender and devoted at least nine months, if not years, of interior design and personnel training to accomplish the makeover of the Population and Immigration Authority. The waiting room was abuzz with babies crying, men speaking to women in Russian, women speaking to children in Arabic, husbands speaking to wives in Yiddish, a father talking to a son in sign language, children screaming with delight as if they were at an amusement park, people eating apples, felafels, chocolate bars, while their eyes went back and forth to the numbers above us, in the hall of changing status. A twenty-year old American guy in a Hard Rock Café t-shirt swaggered around looking ebullient, but confused. He reminded me of my first visit to this office on Shlomzion Hamalka Street in downtown Jerusalem. I was twenty-two and I had just decided to change my status from student to new immigrant. Delete “decided.” That sounds like I made a mature rational decision. Nothing could be farther from the truth. The year was 1967. I was swept into a flurry of Zionistic zeal, my head bursting with expectations of salvation and desire to enter Jewish history through the Zionist narrative. Rather than sit on the sidelines in Baltimore or Cleveland, I wanted to stay in Israel and, well, just stay in Israel. At twenty-two that seemed enough of a plan for the next twelve months. Aren’t all “decisions” of twenty-two year olds motivated by passion? I wanted to belong to the State of Israel, to create a new identity and this was the hall where I got my belonging papers. Easily I received immigrant status and then citizenship, as if I had never stood with tears in my eyes at the Lincoln Memorial, never pledged allegiance at Mount Vernon and Monticello, never fantasized living in a log cabin, walking the Oregon Trail, never fallen in love with Walt Whitman. I was a fickle young American, easily swayed and thus, easy bait for the State of the Jews. When 124 flashed, a young mother bent over a carriage to kiss her crying baby. I recalled my visits to the Population and Immigration Authority after the birth of each of my three children to apply for their birth certificates and to make sure their names and Hebrew birth dates appeared on the flimsy paper of my ID card. I was so proud that my children were born in Israel. The longer I sat in that hall, watched and waited, the more Israeli decades passed before my inner eye as though I was watching This Is Your Life and the surprised guest was me. By the time 138 flashed from all corners, I felt comfortable in my Israeli skin. This was the county in which I had forged myself a la Whitman, Neitzche and A.D. Gordon and this was the hall where I received my confirmation papers. I had foregone the PhD in American history. Instead of waving my cap above my head in a medieval graduation ceremony, I glued my Certificate of Immigration above my bed. I would always be an immigrant. By 2014 I was not afraid anyone would steal my identity again. Nonetheless, to be perfectly safe, I opted for a smart biometric passport and ID card. The clerk encouraged me to do so, knowing my middle name was Suggestible. I knew some Israelis were opposed to the State knowing the exact location and size of their facial wrinkles and sunspots, the labyrinths on their fingers, but I didn’t care. In 1967 I had surrendered to the State, body and soul. She could keep my data in her secure or insecure database now, forty-seven years later. Within ten working days when I would receive my biometric documents—the Passport through registered mail, the ID in a short visit to this hall—my identity would be thoroughly mine, only mine, immune to theft. It was worth the 280 New Israeli Shekels. Also the memories were mine, the adventure, the leap into the unknown, the living on the edge of the stage of history. These too could never be stolen, though the Ministry of Interior didn’t care about these kishkes. These were solely mine, as were the loss of innocence, the disappointments, lies, shame, fences, frustration and grief. They were all mine. They would always be mine, as would the love of a twenty-two-year old, a love pure and passionate, a love that still flickered, like the soft light one sees after the sun sets into the Mediterranean, those pink and golden wisps of clouds, light shields against heavy darkness. This entry was posted in Identity, Zionism and tagged Immigrant, Ministry of the Interior. Bookmark the permalink. This is amazing. I was even younger when I made that leap of faith, but you’ve described it in a way I never dreamed of. This is wonderful. Gave me chills, Judy. Beautiful. I wasn’t able to make that leap, though I tried, briefly, at 30. I admire and envy you your courage. Not sure it’s courage, Joan. Something closer to desperation.